After a long week of Halloween activities the actual day was here!! I am not sure Richie gets that Halloween is actually just one day, but I think today was the most fun of them all. Although we always did have fun at the North End Halloween party, we thought the kids would prefer to trick or treat with their friends again. The big kids ran from house to house and Chris (and sometimes Doug) dragged Angela along to keep up. They all came home with HUGE smiles on their faces and a lot of loot! HAPPY HALLOWEEN from Spiderman and Skunkie!! Making cupcakes for our Halloween party at the Hardings. Richie told Chris that they had chocolate for snack........I let them lick the bowl! You don't often get two smiling faces in one picture. Richie had his school Halloween party this evening. He had been so excited for days to go, but it wasn't exactly what he had hoped for. One look at the dark room the kids were running around in to the DJ and he was freaked. Then he saw his first big kid with a scary mask and he asked to go home. We did spend a little bit of time with his friends (Emily below) so I don't think he was too disappointed. 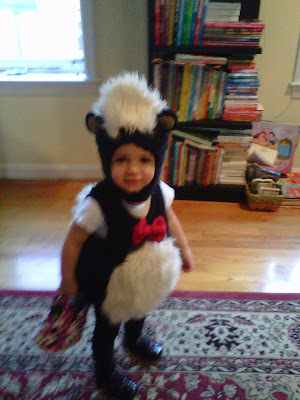 Angela was the hit of the party....our little dancing skunkie!! The MFA (Museum of Fine Arts) has started a new "Playdates" program for kids 4 and under. This was only the second month they have done it and we were the first ones there, but it was still a great program. We were met at the information desk by about a dozen eager twenty somethings who immediately engaged the kids by taking them to draw and telling them stories. Our tour guide Jake did great keeping the kids involved and interested. October's theme explored the art of costumes and wearable art. With a free pass to the Museum from MIT and a children's program, I think we will go again! I am going to be all Halloween-ed out!" This was Dawn's plan for the day. Angela woke up not feeling well so they wound up heading home after Hunters party for a mid afternoon rest. The two kids had a great afternoon though. They had to hit the tub at 5:30 because they were covered (literally head to toe) in paint and we were heading to the Shumway's for dinner. Yep, another Halloween party this weekend! This time at Castle Island in Southie. This party was very cool because they transformed Fort Independence into a Haunted House. They even had a smaller kids section. Unfortunately it was all too scary for Richie. He didn't even make it through the door! So we enjoyed the airplanes (Angela screamed a-pain for each and every one that went over head! ), water and boats, playground and just being outside! Since Halloween is right around the corner, it was time to carve our pumpkin into a jack-o-lantern. The kids were so excited, but we quickly found out that our pumpkin was already past its prime. When Chris cut off the top....well he had to cut off a lot of the top....... The funny part is that when Chris picked that pumpkin Richie hated it because it had these 2 holes in it. Chris kept telling him it was fine because the other side was the perfect side for a face. Well it turns out that Richie was right! It was rotting. Since the kids were going to be SUPER disappointed if we said "sorry we can't do this tonight",we had to improvise. Chris cut all of the rotten part out of the pumpkin and we searched the house for a hat big enough to cover the hole. Yes our pumpkin has a cowboy hat, yes Richie wore his costume ALL DAY and yes, Angela was very skeptical of the jack-o-lantern! The kids and I spent a beautiful Saturday morning at the Stone Zoo with our friends the Tilden's. This is the 3rd zoo we have been to this year and the funny part is that this one is just a few miles from our house. And the Tilden's actually walked there! We had to hit Boo at the Zoo again this year because it was all Richie asked to do for Halloween. He remembered going last year with Colton in their costumes. So this year Spiderman had to go even though Colton was in Florida with Mickey! After the zoo we went to the Tilden's for lunch. Richie proclaimed that Matt made the best grilled cheese in the whole world! As the kids played I got a great picture of baby Logan, but still have had no luck with Maggie. Today was one of those days that still makes me want to cry like the first day of school. It was Poetry Day at St. John School and each of the grades got to come up and recite a poem they had learned. The K1 kids did A Brand New Friend (as you can see in the video!). I didn't know anything about Poetry Day (I had not looked ahead on the calendar) so I had no idea Richie knew this poem. When I finally asked him about it (just yesterday) he recited the whole thing........I was pleasantly surprised, but shocked. The kids were all adorable and so proud of themselves. As we were walking home, one of the big kids came up to Richie and said, "Great job today". He was over the moon! We had the guys Chris works with over for dinner tonight so we shipped Richie off to Aunt Erin and Uncle Matt's house for a sleep over! He was so excited he packed his bag as soon as he got home from school. They obviously had fun (and stayed up late watching movies) because he fell asleep on the couch the next morning at 11:30. Since Richie loves soup and his favorite color is orange, I thought squash soup for dinner would be a winner. Well it was a winner for one at least......one guess as to which one that was! They both liked my potato leak soup......you just never know with kids. And needless to say we went straight from dinner to the tub. "Here are the only pictures that I have been able to take of the kids in the past 2 months. Most of the time, when I ask Angela to smile, she pouts or walks away. Rich usually says "no pictures " or whines "stop taking my picture and play!!" The first picture is from when Dawn watched the kids for us so we could go to the Yankee/Red Sox game on a Saturday afternoon. 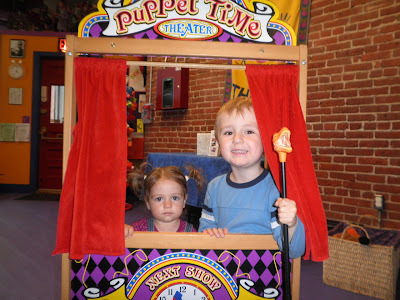 The show was Little Red Riding Hood and Other Tales at the Puppet Showplace Theater in Brookline. "Today was such a great fall day! Rich kept saying "it's soooo beautiful out!" For some reason he actually wanted me to take his picture everywhere we went! We walked through the gardens, fed the ducks cheerios (I know we aren't supposed to! ), danced to some music that was being played on the bridge, and laid down at the edge of the duck pond and played in it with sticks! We then went to visit the "duckie family" where Rich tried out every one! 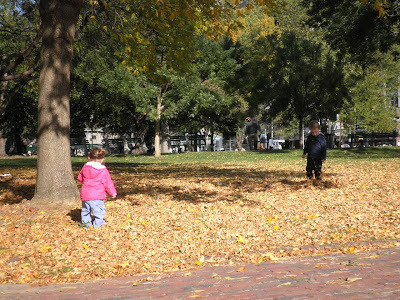 Then off to the commons to play in the leaves and then the playground. With the exception of Angela causing me to have several near heart attacks at the playground, the kids were so great today! Your daughter is absolutely fearless! She climbed up the playground to the top of the big slide where all the older kids were. Then, she pushed a kid who must have been at least 8 out of the way and proceeded down the slide head first. Thank goodness for padded playgrounds!" I say thanks goodness for Dawn! !